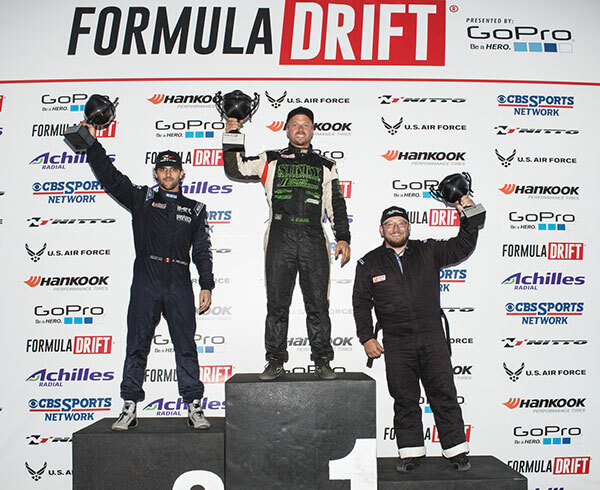 Long Beach, Calif. – July 24, 2015 – Formula DRIFT PRO 2 continued the season at Evergreen Speedway for the second of four rounds of competition. James Evans in the Sikky Racing Nissan 350Z takes the victory. PRO 2 continued to the Pacific Northwest at Evergreen Speedway for the second round of the 2015 season. The on-track conditions were demanding with many vehicles seeing damage through the course of the event. Evans faced off with PRO 2 points leader, Alex Heilbrunn in the IMR BMW 3-Series, in the finals. On the first battle, Heilbrunn went into the wall and was unable to continue giving Evans his second consecutive victory at Evergreen Speedway. Evans moves into second place in the PRO 2 standings, while Heilbrunn maintains his top position. Faruk Kugay in the Bay Shore Supply / Limitless Motorsports Nissan S14 lands in third place for the event and moves into fourth place in the standings.